To tie in with the previous post, here's another view of Mill Hill. This is New Chapel Street. I'm not sure if the '1950' on the left is an indication of the year, or a serial number on the image, but looking at the mode of dress, it would appear to be a photograph taken around that time. In the distance, at the far end of the street, is Mill Hill Congregational Church, which replaced the original chapel (after which the street takes its name). The original chapel was just a room or two, on the upper floor of the school which once stood behind the low wall on the right, kind of behind the bicycle's rear wheel. COURTESY OF COTTONTOWN & THE COMMUNITY STUDIES DEPT. BLACKBURN LIBRARY. I think your comment has ended up on the wrong photo Peter, but I know the one you mean. Cheers. My great great grandfather was the minister at the Mill Hill Chapel from circa 1859 - 1864. He met and married my gggma, a Blackburn Hudson there. I have a drawing of the church building, but this is the first photo I have seen of it. I am hoping that you can send me a good quality scan of it and see if you have any other pics of the building. It may be asking a bit much, but perhaps you can consult a city directory and see if you can determine where they lived. William Henry and Margaret Mann were their names. Thank You so much from Texas. 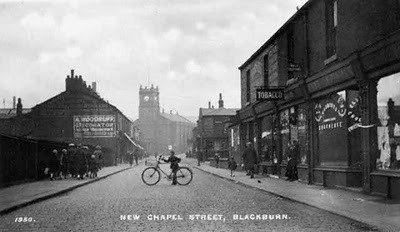 Hello Blackburnlad, I am delighted to see this picture, which is the first I have seen of what I believe was my great great grandparents' church, Mill Hill Chapel. William Henry Mann was the minister there from c. 1859 to c. 1864. He met and married a Blackburn girl, Margaret Hudson there in 1863. Shortly thereafter they sailed for Natal to spread the Gospel and build the Empire. Would you be so kind as to send me a better quality scan of the picture plus any others you may have on the subject; and if it is not asking too much, would you consult a city directory and see if you can determine where they lived (presumably the manse)? Thanks in advance from the great great great grandson of a Blackburnlad, now in Texas. If you type congregational church into the search in the top left corner on here, it brings up a close-up image of the church and a few details. I don't have any directories that early (sorry). You would maybe be able to get some details via Blackburn Reference Library. Google them and then e-mail the address on there with any queries. Also have a look on the library website, Cottontown (again, either Google it or use the link in the right hand column on this site).